We offer a wide range of buses for all your charter needs. We would like to take this opportunity to introduce you to Adelaide Coachlines Pty. Ltd. which is a Family Owned & Operated Company and has operated Buses and Coaches in Adelaide since 1960. Our Company operates a fleet of 25 vehicles which are meticulously cleaned & maintained at our workshop by qualified staff. Our staff, both Coach Drivers & Mechanics, are chosen for their punctuality, courtesy, neat & tidy appearance and driving ability. Our Company has provided services for many major events, such as The Australian Formula One Grand Prix, World Masters Bowls and World Masters Squash, the Inter-Dominion, the International Horse Trials, numerous large & small Conference & Convention Groups, plus Her Majesty’s the Queen’s Delegates on her recent visit to Adelaide. In 2016 we supplied vehicles for ‘Dreamtime’, an event showcasing the best of South Australia. On an ongoing basis, our Company provides Coach Transportation involving a variety of clients which include, Inbound Specialist Groups, Inbound Tour Operators, Corporate Companies & Clients, Professional Conference Organisers, Senior, Sporting and Social Club Organisations, Schools, Travel Clubs & many more. Adelaide Coachlines Pty. 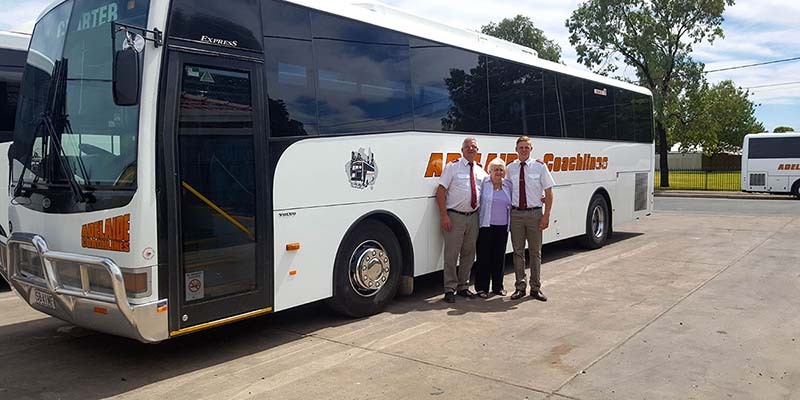 Ltd. is supported by a sister company, Adelaide Coachlines Travel Pty. Ltd. This enables people to book with confidence, as this Company is a licensed member of the Travel Compensation Fund. Our company has years of experience in serving customers in the Travel Industry and we are fully accustomed to the level of flexibility, professionalism, and security they require. “From weekly Pokie Trips to Broken Hill and an affiliation with the Adelaide Grand Prix in the past, to extensive snow and interstate trips, a strong relationship with WomAdelaide and a heavy involvement with Interstate and International travelers, Adelaide Coachlines has been able to grow along with the bustling city that Adelaide has become. With buses from 21 up to 57 seats comprising our fleet of 26 vehicles, we are more than capable of handling any requirements in which your group may need. All vehicles are kept meticulously cleaned & maintained at our depot in Edwardstown. Our staff, are selected for their punctuality, courtesy, neat & tidy appearance and driving ability.